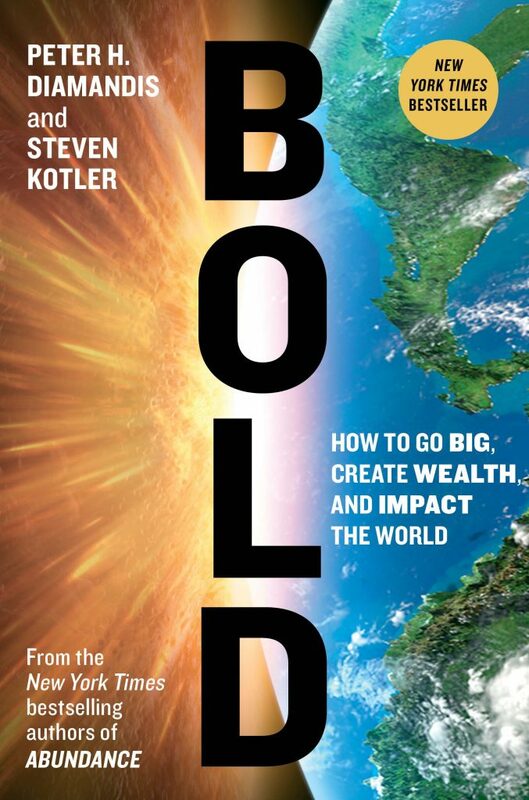 По итогам прочтения Bold by Peter H. Diamandis and Steven Kotler - Go Practice!Go Practice! Anything that becomes digitized hops on Moore’s law of increasing computational power. Edwin Locke identifies traits of great business leaders … he found one key trait they all shared: vision. … the most important telltale factor is the development of a simple and elegant user interface — a gateway of effortless interaction that plucks a technology from the hands of the geeks and deposits it with the entrepreneurs. In the late 1960s, University of Toronto psychologist Locke discovered that goal setting is one of the easiest ways to increase motivation and enhance performance. Be setting big goals, we are actually helping ourselves achieve those big goals. Trying out crazy ideas means bucking expert opinion and taking big risks. It means not being afraid to fail. Because you will fail. The road to bold is paved with failure, and this means having a strategy in place to handle risk and learn from mistakes. Once we pay people enough so that meeting basic needs is no longer a constant cause to concern, extrinsic rewards lose their effectiveness, while intrinsic rewards — meaning internal, emotional satisfactions — become far more critical. Autonomy is the desire to steer our own sheep. Mastery is the desire to steer it well. And purpose is the need for the journey to meen something. These three intrinsic rewards are the very motivators that motivate us most. Where GoogleX deviates from traditional skunk is with the size of the goals they’re setting. Moonshots, by their definition, live in that gray area between audacious projects and pure science fiction. Instead of mere 10 percent gains, they aim for 10x improvements. Most critically here, this 10x strategy doesn’t hold true just for large corporations. «A start-up is simply a skunk works without the big company around it.» says Teller. Applying this idea in our daily life means breaking tasks into bite-size chunks and setting goals accordingly. A writer, for example, is better trying to pen three great paragraphs at a time, rather than attempting one great chapter. Think challenging yet manageable — just enough simulation to shortcut attention into now, not enough stress to pull you back again. Our final trigger, Always say «Yes, and … ,» means interaction should be additive more than argumentative. The goal here is momentum, togetherness, and innovation that comes from ceaselessly amplifying one another’s ideas and actions. It is a trigger based on the first rule of improv comedy. He shared stories about how close the space inventors, engineers, and visionaries of the 1940s and 1950s were to one another. It was the power of their collective friendship, knowledge, and vision that ultimately gave a birth to the Apollo Program. The idea of such a tight network got us dreaming about creating an International Space University. A second lesson that we learned on our way to founding the university: the critical importance of staging your bold ideas. I’ve come to think of making a stone soup as the only way an entepreneur can succeed. The stones are, of course, your big bold ideas. The contributions of the villagers, the capital, resource, and intellectual support offered by investors and strategic partners. Everyone adds a small amount to your stone soup in fact helping to make your dreams come true. «If anything can go wrong, fix it! (To hell with Murphy)» Peter’s Law. Start collecting mind hacks by examining your own life and seeing what strategies consistently worked along the way. Turn those strategies into your laws. When someone says no, it’s often because they’re not empowered to say yes. In many organizations , the only person who can say yes is the one atop the food chain. «The important thing is to start, to lay a plan, and then follow it step by step no matter how small or large one by itselft may seem» Charles Lindbergh. If you can’t win — change the rules. When faced without a challenge — make one. No simply means begin one level higher. Patience is a virtue, but persistance to the point of success is blessing. The best way to predict the future is to create it by yourself. If you think that it is impossible, then it is for you. The day before something is a breakthrough, it is a crazy idea. If it was easy, it would have been done already. If you can’t measure it, you can’t improve it. (I start thinking that it is not true in all cases — Pixar Braintrust). The world’s most precious resource is the persistent and passionate human-mind. «The usual circle of beginning a company begins with a lot of optimism and enthusiasm. This lasts for about six months, and then reality sets in. That’s when you learn a lot of your assumptions were false, and that the finish line is much further away than you thought. It is during this period that most companies die rather than scale up.» Elon Musk. «Physics training is a good framework for reasoning. It forces you to boil things down to their most fundamental truths and then connect those truths in a way that lets you understand reality. That gives you a way to attack the counterintuitive, a way of figuring things that are not obvious. When you are trying to create a new product or service, I think it is critical to use this framework for reasoning. It takes a lot of mental energy, but it is still the right way to do it» Elon Musk. «Outcomes are usually not deterministic , they are probabilistic. But we do not think that way. The popular definition of insanity — doing the same thing over and over and expecting a different result — that is only true in a highly deterministic situation. If you have a probabilistic situation, which most situations are, then if you do the same thing twice, it can be quite reasonable to expect a different result» Elon Musk. How Elon Musk chooses which streams to explore depends on the relationships between those probabilities and the importance of his objective. Even if the probability of the success is fairly low, if the objective is really important, it is still worth doing. «Protecting downside is critical. Make bold moves but make sure to have a way out if things go wrong.» Richard Brancon. «It is so hard to catch something that everybody already knows is hot. Instead position yourself and wait for the wave to come to you. So then you ask, position myself where? Position yourself with something that captures your curiosity, something that you are missionary about.» Jeff Bezos. «How do we decide what is really important to work on? I like to call it the «toothbrush test». It is simple: Do you use it as often as you use your toothbrush?» Larry Page. «You would think that as we do more ambitious things, our failure rates would go up, but it doesn’t really seem to. The reason, I believe, is even if we fail in doing something ambitious, you usually succeed in doing something important. I like to use example of our first attempt to crate AI back in 2000. We did not succeed, but we did come up with Adsense.» Larry Page. What most people want to hear is why your product will improve their life — why it is significant, cool, and important to them and the world. Think solutions and improvements, not explanations or specifications. Even the most technical of ideas needs to be framed inside a greater narrative. If you can’t come up with one, tell the story of how and why you came to create the product you are selling. When you launch above the line of super-credibility , people instantly accept your project as real and believe in their hearts that it is going to work. One common misunderstanding about crowdfunding is that most of your backers are strangers. The truth is that crowdfunding is often a combination of a normal funding strategies (seeking capital from your network) and crowdfunding strategies (anonymous public donors). The major mistake most people make in crowdfunding is their assumption that simply posting your campaign on platform is enough. You, not the platform, is responsible for driving traffic to your page. More traffic you drive — more money you raise. If your community can provide a legitimate release valve for peoples incredibly frustrated passion, you are unleashing one of the most potent forces in the history of the world. People join communities for the ideas, they stay for the emotions. Here are few examples of common types of market failures. People believe that a problem is not solvable. There is a stigma that prevents people from even trying to solve a problem. Entrenched players or unions prevent fair competition o transformation of the industry. Capital is not flowing into important problem area.